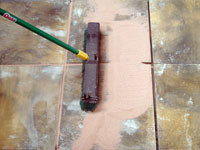 No more mixing wet mortar - No more cement stains - No more pointing the joints in paving. Just mix one tub of our Magic Sand liquid with one bag of kiln dried sand (you supply the sand) - brush the Magic Sand mix into the joints and watch it set. Just mix one tub of our Magic Sand Liquid Pack with one bag of kiln dried sand (you supply the sand) - brush the Magic Sand Liquid Pack mix into the joints, run a trowel over to ensure no air spaces below the surface and watch it set. Unlike the premixed self jointing compounds you can buy, where you have to use a full bag which starts setting as soon as you open it – with Magic Sand Liquid Pack you can mix as much or as little as you need and it is MUCH CHEAPER as well.